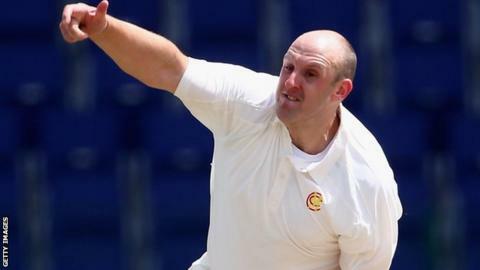 MCC spinners James Tredwell and Samit Patel made life tough for Yorkshire on day three of the Champion County game. Tim Bresnan (4-58) and Karl Carver (4-106) wrapped up the MCC first innings for 299 after Ben Foakes fell for 91, a first-innings lead of just 24. Yorkshire struggled to 147-6, despite 86 by Alex Lees, as Tredwell (3-70) and Patel took five wickets between them. But Andrew Hodd (44) and Will Rhodes (41no) added 80 to steer them to 239-7 at stumps, 215 ahead with one day left. The MCC only managed to add 17 to their overnight 282-6 after slow left-armer Carver bowled Foakes with the final delivery of the day's opening over. And he wrapped up the innings by having Jake Ball stumped after Bresnan won an lbw decision against Rikki Clarke, who made 58. Yorkshire soon lost Adam Lyth to off-spinner Tredwell, lbw for seven, and first-innings centurion Gary Ballance managed only nine before his off-stump was knocked out by Middlesex paceman James Harris. Lees batted for over three hours and hit a six and seven fours, but missed out on a century when Patel (2-48) found a way through to bowl him as the county champions lost three wickets for 10 runs in the space of six overs. Hodd and Rhodes steadied the ship before the former was leg-before to Ball shortly before the close, leaving the match in the balance for the final day.